Advantech has announced the launch of the new IDK-2000 series of 1200-nit ultra-high brightness LED display kits. Advantech IDK-2000 series extends the benefits of the current IDK series, providing cost-effective display solutions that offer maximum flexibility in mechanical design, and proven compatibility with Advantech embedded boards and systems. 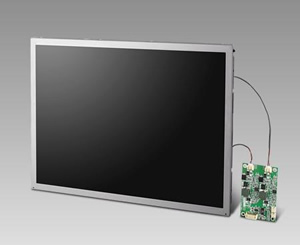 Ranging from 8.4” to 19”, each IDK-2000 kit comes with a 1200-nit industrial grade LCD panel, an LED driver board, and optional resistive touch screen integration. The IDK-2000 N series is a basic 1200-nit non-touch display kit model, while IDK-2000 R is a resistive touch model. The new IDK-2000 series is three times brighter than standard models, providing superior sunlight readability. Equipped with superior sunlight readability and wide operating temperature support, this series is designed to be used for outdoor applications such as gas pump payment kiosks, vending machines, and more. Display brightness is important because it affects readability under different lighting environments. In some outdoor and high ambient lighting conditions, a conventional 350-nit display appears washed out and is difficult to read due to the insufficient brightness. Advantech IDK-2000 series is bright enough to be read in direct sunlight; its excellent display visibility makes it the best choice for sunlight readable solutions. With a high level of brightness and wide viewing angles, IDK-2000 series provides optimal readability, whether in direct or indirect sunlight conditions, and is ideal for all applications, indoors or outdoors. One major concern about high brightness is power consumption. With our intelligent high brightness LED technology, Advantech is able to upgrade display brightness up to 1200-nit, yet with low power consumption, longer product life, and unchanged mechanical design. Advantech IDK-2000 series uses a green LED light bar in place of CCFL as the backlight source. This, coupled with optical films, advanced reflection pattern design on light guide bottom, and special radiation technology enable us to achieve 1200-nit with a low-power backlight source. Compared to traditional CCFL, LED backlight provides a mercury-free solution, better uniformity, and enhanced colour contrast and saturation. Most important of all, Advantech IDK-2000 series requires about 20% less energy than competing products with the same level of brightness. For example, a 17” LCD at 1000 nit usually consumes 35W while Advantech IDK-2000 series only consumes 29.47W, resulting in displays that run cooler with maximum reliability. In addition, the surface temperature of the LCD panel is below 40°C under turn-on conditions due to the low heating effect making your devices ideal for any location. The IDK-2000 offers excellent sunlight readable solution with low consumption and low LCD surface temperatures. This series is designed for system integrators providing both indoor and outdoor solutions. Both IDK-2000 N series and IDK-2000 R series are available now.